Below the image is a fictional story written by my husband. 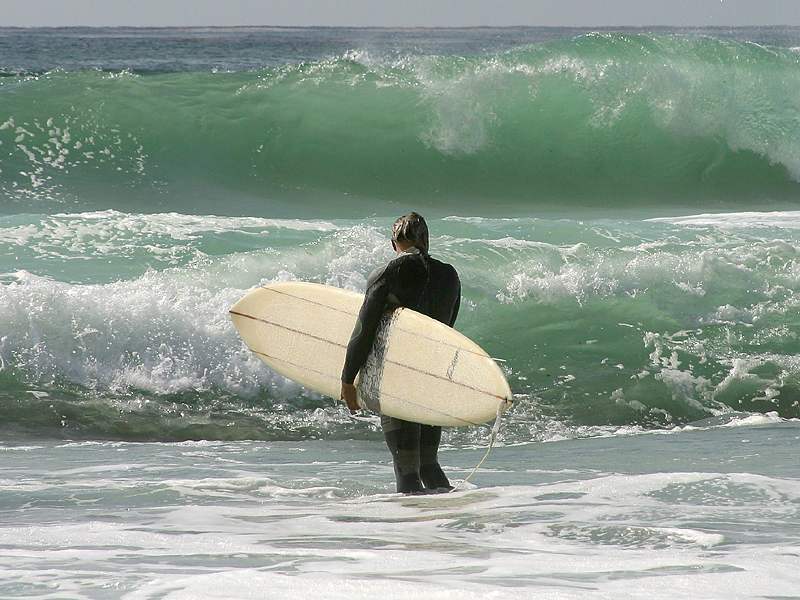 Growing up in Miami, my husband was an avid surfer. If you’ve ever lived in south Florida you know that part of the country doesn’t get huge waves. So my husband traveled quite a bit to find bigger and better waves, but one thing he loved was surfing in Florida when there was a hurricane just off shore. This would of course generate much bigger waves. His story isn’t a scary one, but it has just enough of the spook factor to fit into my Halloween Spook Fest theme. Hope you enjoy it. Grabbing my board, I rushed out to the old Woody where the guys were impatiently waiting. I quickly loaded my board on top with the other three and climbed into the car. Joe was still blowing on the horn even as my backside hit the seat. I told him to lay off it before my dad came out and grounded me. One thing my dad hated was being awoken before sunrise on a Saturday morning. Everyone was in high spirits, thinking about the great waves we’d catch. We raced off down the highway, heading for Breakers Point. We knew the waves would be good because of the storm over the Atlantic. Darrin told Joe to slow down, as he passed around the soda pop and biscuits he’d brought from home. Darrin was the oldest of the three of us at nineteen and was like an old mother hen at times. I had to agree though when he said we’d all like to live to surf another day. We could see the waves were rolling in fast and high, as we parked the car and unloaded the boards. The sun was just beginning to rise and it looked like a giant red ball being pushed up out of the ocean by an unseen hand. In spite of the teasing from Lenny about the artist in me, I had to stop for a moment and take in the beauty of the scene. Red and orange streaks raced against the gray sky. Dark clouds edged in purple were boiling up in the distance. The glassy green of the ocean and the white foamy peaks rushing onto shore were awesome. I couldn’t wait another minute to ride those babies home. I’d been surfing since I was a little kid and there was nothing like the sense of freedom or the rush of excitement from riding a wave. As I was paddling out, I noticed Darrin and Joe had already caught their first waves and were riding them to shore. Lenny was sitting there watching so I paddled out to him and asked what he was waiting for. “I’m waiting for the big one,” he stated calmly. That was Lenny. He could wait in line at the movie house for hours and never get antsy. I thought he was wasting time and letting a lot of good waves pass by while waiting for that one perfect wave. I wanted the perfect wave too, but was willing to ride the others until it came around. I told Lenny I’d see him and paddled off to catch my first wave of the day. While it wasn’t the biggest or most perfect wave, it was still one great ride. I felt the familiar rush of excitement as I gained my balance and went rushing towards the shoreline. After catching several more waves I decided I’d relax and watch the others for a while. Lenny paddled up and the two of us sat there in silence just enjoying the beauty of the morning. “So, what you waiting for now?” He asked me. I jerked my head all around and saw nothing but the smooth glassy water. Lenny began to laugh. He pointed his finger at me for falling for that one and I was tempted to knock him off his board, but I was in too good a spirit not to appreciate the humor of it. He finally calmed and looked over at the waves building. I looked and then began to paddle as fast I could. This was going to be the ride of a lifetime from the looks of the huge wave. It continued to build and at first I thought I’d be able to handle it and make my way into the barrel, then I knew I was in trouble. I turned my board and caught the edge and suddenly I was going in. Water sucked at me and I felt like I was inside Mom’s washing machine during the spin cycle. Angry fists of water pummeled me from all sides like battering rams as I was tossed and tumbled by the churning water. I tried to relax and just wait for that moment when I’d be able to surface. I felt something thump into my head and everything went black. When I came to, I was at the surface with my board still attached to my leg by the surf leash. I climbed on board and tried to get my bearings. I’d been pushed down quite a ways from the other guys and could see them all bunched together looking at the water. I waved my arms, yelling their names and trying to get their attention. They didn’t seem to hear me and I thought I was too far away. While I watched, Darrin and Lenny dove off their boards and went underwater. They came up again, looking all around before climbing back on their boards. I lay down on my board and began to paddle my way closer. As I got near enough to hear them, I knew they were looking for me. I could hear them calling my name. I yelled and waved again, but still they didn’t hear. I didn’t understand why I could hear them and they couldn’t hear me. I paddled closer and could hear them clearly. Sitting up on my board, I yelled and yelled and still they didn’t react. I thought they were kidding around and began to get angry. I was just too tired to paddle any closer and knew I was close enough for them to see me. Suddenly Darrin grabbed at something in the water. He cursed and Lenny began to bawl like a little girl. I knew then that they weren’t kidding. They didn’t hear me and then I saw what Darrin was holding. It was my board. I thought that couldn’t be possible, I’m sitting on my board. Wait, something was very wrong. Am I dead? No, I’m right here. Oh, God, help me. Categories: blogging, general fiction, holidays, nature, photos, writing | Tags: E. G. Parsons, elizabeth melton parsons, Garland Parsons, Halloween, holidays, image, nature, short story, surfing, writing | Permalink. Thank you, Ralph. Big hug. excellent – and I HATE the water! Cogratulations to your husband on a fine tale well told Elizabeth. really scared ….thought it was a dream. i’m scared of my shadow.lol..
lol..that would scare me too..i hope mine doesn’t follow me. Nicely done! I hope there will be a sequel…I feel like I’ve been left to drift with him in the ocean. 🙂 It looks like you’ve taught him everything you know about writing. Perhaps you two should co-write a story. Thanks for sharing, Elizabeth. That’s a lovely compliment, Jill. And actually I do consult with him about characters, plot…so forth. And sometimes I even listen to what he has to say. LOL. He says he’s not a writer, he’s a musician. And while it’s true he’s a fab musician, he may be more writer than he accepts. Not sure about a sequel. I’ll ask him. poor boy! what a story! Good to see you, Sharmishtha. 🙂 Thanks for the nice comment.